Fun? Sure we believe in having fun. We have reserved this section to share things with clients, strangers and each other. We hope that you find something useful or amusing. We will be updating this section from time to time, so come back and see what is new. 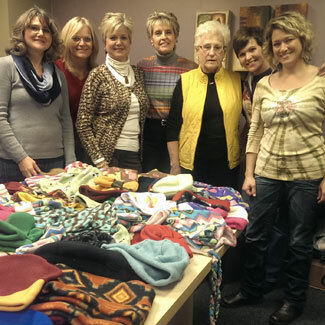 We had another sewing day this past fall and made over 80 polar fleece hats and mittens for three local non profit organizations: Children’s hospital, Mary’s Place and Marie Sandvik Center. Some of us are sewers, and we put the others to work cutting out the hats and mittens. We all had a fun time and plan on doing it again next fall. Recently we had the opportunity to tour the new baseball stadium. Wow! What a great place to enjoy outdoor baseball with your family, friends and associates. We toured for about 2 hours - from top to bottom looking at every angle there is... there is not a bad seat in the whole place. 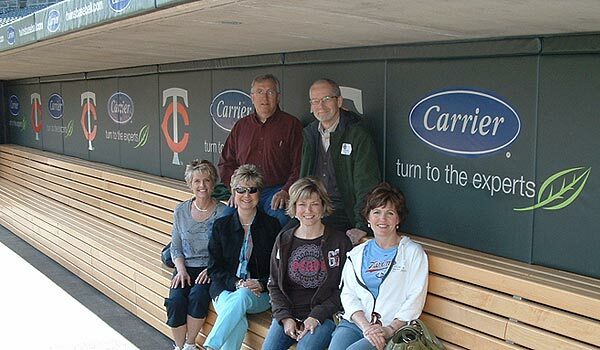 Kim, Dave, Tricia, Darla, David and DeEtta having the opportunity to sit in the same place that Gardenhire paces during the game. Undoubtedly the best view, but you probably need a special contract to sit on this bench during a game. A fun day at work was actually a service project day. We had our first (planning to become annual) quilting day. By late afternoon, we had eight cuddly blankets to donate to PROJECT LINUS. All of the soft flannel fabric used was donated from Tricias sewing closet stash. 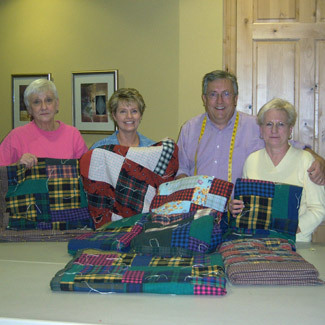 PROJECT LINUS is a 100% volunteer organization dedicated to creating and delivering new handmade blankets to any child who may be in need of some extra comforting that only a beloved blankie can provide. Blankets have been delivered to places like Marys Place (Sharing & Caring Hands) and the childrens hospitals in St. Paul and Minneapolis. It also offers a worthwhile service opportunity for the benefit of children.